Although cyclists believe the roads are safer, drivers continue to make unsafe passes in the park. Cyclists reported a total of 336 passes on blind curve while riding up the mountain. Given that only a portion of the total cyclists in the park completed the survey, the total estimated number of unsafe passes could have been over 1,000 incidents. Considering the number of cars, bikes, and pedestrians on the park roads that day, it is remarkable that there were no serious accidents. In addition, cyclists reported a total of 825 safe passes. This indicates that 29% of the reported 1,161 bike passes were unsafe. Cyclists recommended making the Bike Turnout signs permanent and more visible. Cyclists appreciated the January 1 safety event. They support the Park’s efforts to add solid double yellow lines, improve signage and bike turnouts. Clearly, these interventions are making a difference. Unfortunately, passing on blind curves continues to be problematic, but safety is now a point of emphasis more than ever before. As part of a New Year’s day event at the summit of Mt. Diablo, cyclists were asked to complete a survey to gather information about safety in the Park. 128 cyclists took the survey. Not everyone answered every question. All written comments are included. 1. How often do you ride up Mount Diablo? 2. Where did you enter the Park today? 3. How many vehicles passed you on a Blind Curve? 84 Cyclists reported a total of 336 Blind Curve incidents, or an average of 4 incidents per reporting cyclist. 4. How many vehicles passed you in a safe location? 98 Cyclists reported a total of 825 safe passings, or an average of 9 safe passings per reporting cyclist. 5. How are Solid Double Yellow lines making the roads safer? There were three general categories of response: Supportive, Not Supportive, and Don’t Know/No Response. Responses are listed as written within each category. 6. How are DO NOT PASS BIKES ON BLIND CURVES signs making the roads safer? There were five general categories of response: Supportive, Mildly Supportive, Not Supportive Don’t Know/No Response, and Suggestions. Responses are listed as written within each category. 7. How are AVOID CRASH – SLOW DOWN signs making the roads safer? There were four general categories of response: Supportive, Mildly Supportive, Not Supportive, and Don’t Know/Haven’t Seen. Responses are listed as written within each category. 8. Did you see the Bike Turnout signs as you rode up the mountain? How could this signage be improved? There were five general categories of suggestions: Multiple, Visibilty, Permanent, Roadway, Location, Education, and Quantity. Other statemens supported the existing turnouts. Responses are listed as written within each category. 9. How many Bike Turnouts did you use today? 11. 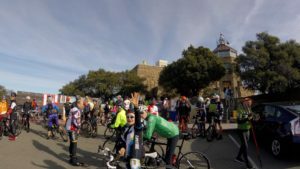 How many Bike Turnouts would you like to see on Mount Diablo? 12. What is the phone number to report an unlawful act to a Ranger? 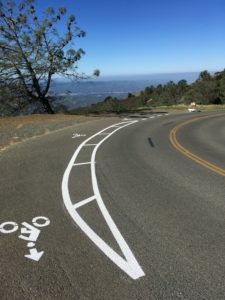 Please go to mountdiablocyclists.org for more information, documents and videos.